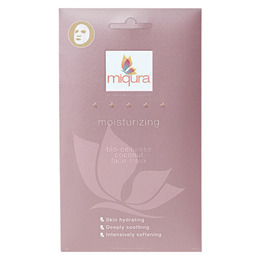 Miqura Moisturising Face Mask is a unique bio-cellulose mask, made with 100% natural fermented coconut juice, making the mask fiber 1000 times finer compared to traditional cotton sheet face masks. The mask will make up an extra skin layer and its delicate structure allows the skin to absorb all the gel. The gel, containing hydrolysed collagen, softens and refines your skin, as well as hydrating and increases elasticity. Water, Butylene Glycol, Glycerin, Propanediol, 1.2-Hexanediol, Olive Oil Glycereth-8 Esters, Carbomer, Arginine, Xanthan Gum, Panthenol, Allantoin, Hydrolysed Collagen, Caulerpa Lentillifera Extract, Dipotassium Glycyrrhizate, Ethykhexylglycerin, Sodium Citrate, Polysorbate 20, Disodium EDTA, Fragrance, Sodium Hyaluronate. Below are reviews of Miqura Moisturising Face Mask - 25ml by bodykind customers. If you have tried this product we'd love to hear what you think so please leave a review. 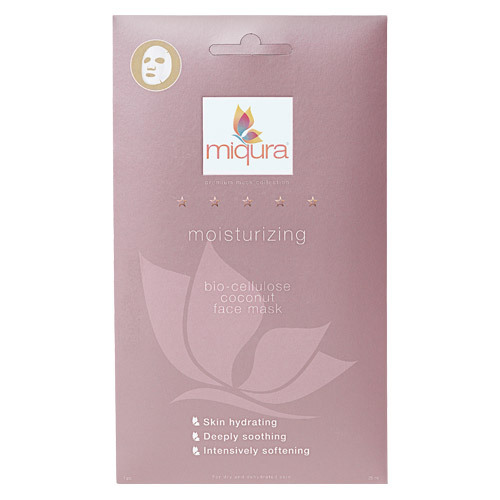 Miqura Moisturising Coconut Face Mask is a unique bio-cellulose mask, made with 100% natural fermented coconut juice, making the mask fiber 1000 times finer compared to traditional cotton sheet face masks.